For Windows stalwarts, the move to Windows 10 has meant embracing a number of changes. Since Windows 8, Microsoft has been keen to push its modern interface, and this is a drive that continues with renewed strength in Windows 10. In ushering in the new, the old has to be let go -- and one of the next features for the chop is the Control Panel. At the moment, Windows 10 users have something of a strange, split experience when customizing the operating system and changing settings. Some things are handled by the old-fashioned Control Panel, others by the Settings app. 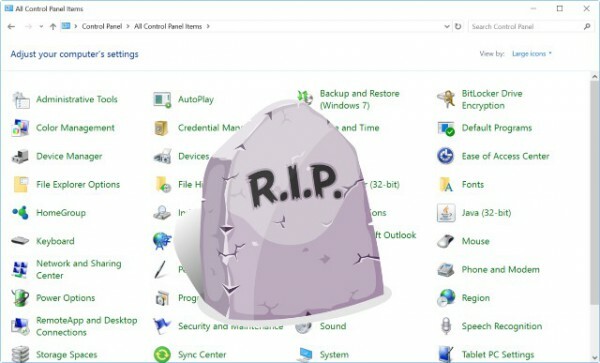 Microsoft's Gabe Aul and Brandon LeBlanc have made it clear that the Control Panel is due to die. @ttmRX3 Different people have different opinions about this. We get lots of feedback asking to get all CPL settings into Settings app. Windows Insiders will be the first to experience Windows 10 with a beefed up Settings App and a cutback -- or non-existent -- Control Panel. While Microsoft is responding to questions and feedback about the direction it is taking Settings in, the company has not committed to any sort of schedule. There's clearly still some work to do because, although the capabilities of Settings have expanded greatly over the months, the Control Panel remains far more powerful. When the day comes, will you be among those mourning the loss of the Control Panel?